HOSTLIFE Review 2019: Is HOSTLIFE a Good Hosting? I signed up to HOSTLIFE, reviewed their unique features, tested how easy they are to use, checked with support on several issues, and tested the speed of the live site. When done, I tried to cancel my account and receive a refund. This is my experience with HOSTLIFE - I hope you can learn from it. HOSTLIFE has more than 13 years of expertise in the web hosting industry. They provide high-quality services and have established a good reputation for themselves since they set up shop in 2005. Although their primary markets are Russia and Ukraine, they also have customers in many other countries including Kazakhstan, Moldova, Lithuania, Bulgaria, Germany, the Netherlands, and the United States. To date, they have served more than 34,000 customers with virtual hosting, VPS/VDS, and dedicated servers. Although HOTLIFE’s website ostensibly allows you to switch between the Russian and English languages, only the home page and menus actually seem to be available in English. HOSTLIFE’s shared servers are currently limited to Europe, so you can only be hosted in Ukraine, Russia, Germany, and the Netherlands. If you want to be hosted in the U.S.A, you’ll have to choose a VPS/VDS or dedicated hosting plan instead. You can choose to use either the DirectAdmin or cPanel control panel to manage your hosting and to execute Softaculous auto-install scripts on your website. This company also offers an adaptive website builder with more than 190 designs. More experienced webmasters will enjoy support for different PHP versions (4.4 to 7.2), CGI, Ruby on Rails, Perl, and Python. Another plus is their provision of unlimited MySQL and PostgreSQL databases on all plans. The shared servers are backed up automatically on a daily, weekly, or monthly basis (as you wish) and you can restore any backup with one click. One thing that sets HOTLIFE apart from other hosting providers is that they also provide backup facilities for VPS/VDS and dedicated hosting servers rather than leaving it entirely to you. You can get 25 GB (VPS) or 50 GB (dedicated) worth of backup on their remote servers. Digging a little deeper, I can tell you that HOSTLIFE also provides advanced security thanks to CloudLinux which separates clients into their own spaces and prevents the spread of malware. To top it off, the AI-Bolit virus scanner scans your website for viruses and malicious code. HOSTLIFE’s shared hosting plans are extremely affordable for a hosting provider that offers numerous unlimited features. The same can be said of the dedicated hosting, but not of the slightly overpriced VPS/VDS hosting. This vendor offers a 30-day money-back guarantee, a seven-day trial on all shared and virtual hosting plans, and one month of hosting free if you are transferring a website from another provider. When you pay for three months, six months, one year or two years (depending on the plan) you can get a free domain name with a .ua or .ru extension. You can communicate with HOSTLIFE’s helpful and prompt 24/7 support team via telephone, support ticket, email, Skype, ICQ instant messaging or live chat. There is also an FAQ section on their website. HOSTLIFE prides itself on delivering excellent web hosting solutions and speedy problem-solving to businesses of all sizes. Their packages will appeal particularly to Ukrainian and Russian customers that can benefit from the slightly biased specialized support. But you don’t need to count yourself out just because you’re somewhere else in the world. Check out HOSTLIFE’s web hosting options today! 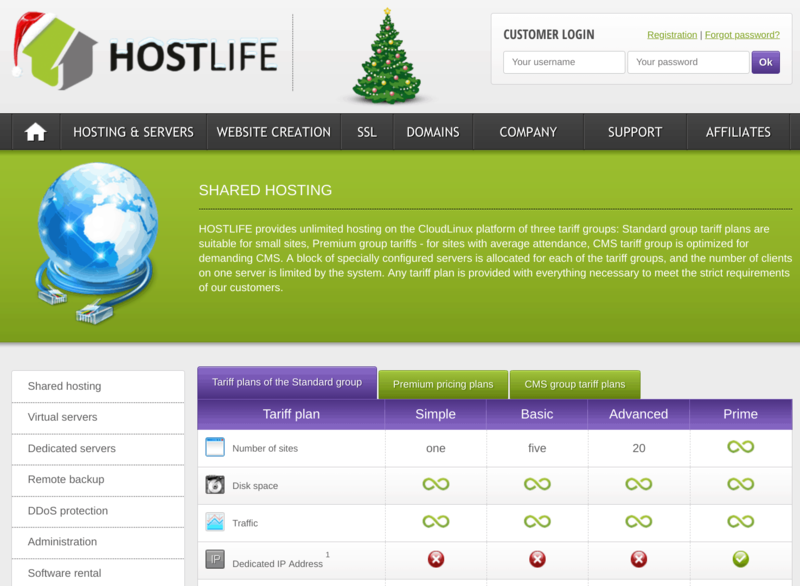 Wondering how HOSTLIFE stacks up against other Web Hosting companies? Enter any other Web Hosting company and we will give you a side-by-side comparison.